Dallas, get ready for your close-up. Davaillon’s fine French cuisine has star power. 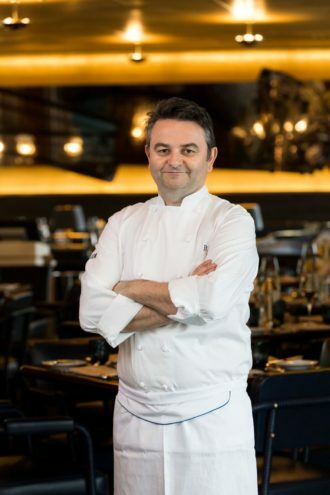 When Chef Bruno Davaillon took over the kitchen at the Rosewood Mansion on Turtle Creek, many food writers and veteran diners were excited to welcome a real French chef with a Michelin star to Dallas. Davaillon earned his star while toiling for Alain Ducasse’s Mix restaurant in Las Vegas. Davaillon pranced into the dismal economic scene in Dallas like a culinary unicorn of hope. It was 2009. Most high-end restaurants were slashing wine and entrée prices to put butts in the seats. Davaillon put his head down and did what he does best, he cooked. I sampled many of Davaillon’s creations while he was at the Mansion. His soups (asparagus! carrot!) were refined, intense. I can still taste a dish of fresh Maine lobster surrounded by poached rhubarb and crunchy blood sausage made with lardo and leeks. Despite flashes of brilliance, I always felt Davaillon’s talent was shackled by the confines of a hotel kitchen, even if it was the fanciest in town. The menu, a mix of the tastes of Texas and France, fit him like a tight jacket. Many of us yearned for fine French cooking. Dallas has some old stalwarts, but we were ready to drink French wine and try to read French on a menu again. French food has always been a backbone of fine dining in Dallas. From the wings, we begged Davaillon to let his French freak flag fly. Dude! You can leave the Rosewood Mansion on Turtle Creek, but you can NOT leave Dallas. C’est absurde! I understand the benefits and security of working in a hotel, but Bruno, I mean Chef, you deserve your own restaurant in Dallas. I’m sure you can convince a local investor to build you a temple and let you do your own thing in the kitchen and hire someone else to greet the public. Bring us fine French food! Cook like Ducasse! Or make hamburgers. I don’t care, just please don’t move away. Well, Dallas you can thank me for my efforts. Last Wednesday, I attended a soft opening, complimentary dinner at Bullion and I’m thrilled to say Davaillon’s French heritage is the center of every plate. I’ve eaten at Alain Ducasse in Paris, and I wish I had the $5,000 tab for five back, so I could afford to eat at Bullion every week. The dining room is luscious. It is elegant without pretension. The same goes for the tabletops covered with dishes (Bernardaud), flower vases (Lalique), and silver (Christofle). The banquette seating in the long rectangular brasserie-style room is divided by low brass rails. From any seat, you can see almost every person in the restaurant. The warm blue tones and gold accents create a contemporary vibe, with a touch of mid-century modern design for those of us who remember the stylish dining rooms of yesteryear. We can thank Swedish interior architect Martin Brudnizki for creating a space where everyone looks as gorgeous as the setting. The highlights of the tasting menu that rolled across my table for three hours included a marvelous pâté of duck leg confit and foie gras with a touch of sherry vinegar served with thick slices of warm, toasty grilled brioche. The bread last Wednesday night was supplied by Empire Baking Company. The kitchen begins baking their own later this week. A finer or fresher steak tartare you will not find in Dallas. The cold meat hits your tongue just as a flash of ridiculously fragrant chopped chive explodes in your mouth. The hydroponic herbs and lettuces grow in the kitchen’s indoor vertical garden built by Jody and Max Wall of Dallas Urban Farm. This concept is a game changer for salads. A bowl filled with butter lettuce and pungent microgreens ever-so-lightly blessed with a scent of citrus and shallot vinaigrette will forever erase your urge to order a “field of mixed greens” again. Remember Duck à l’Orange? Back in the day, it was the palate-friendly Moo Goo Gai Pan of French food. Diners who didn’t want to hear about livers or other fancily prepared organ meat could find solace in a piece of duck slathered in orange marmalade. Davaillon gives us a new motivation to crave this classic dish. He cooks the duck on the bone long and low and slices a long thick, pink strip with crisped skin. The chic meat is placed on a plate and bathed in duck stock scented with orange, anise, cardamom, mace, and peppercorns. Sorry, Ducasse. You’ve been bested. We thought the meal had ended with a lavish and a light Mille-Feuille, thin layers of house-made arlette puff pastry layered with vanilla pastry cream and sprinkled with vanilla powder. But as soon as the dessert plate vanished, we finished with what I suppose you could refer to as a liquid course. Frankly, I can’t remember which appeared first, but we enjoyed both an exotic blood orange rooibos tea served in a delicate china cup and a digestive drink of Pernod and water. Bullion has so many other great qualities. They offer a lovely selection of French cheeses and daily specials. The bar is an absolute must-visit for a mescal cocktail and small bites. Service and staff are attentive and friendly. Bullion’s debut hits Dallas at the right time. Although this city is teeming with new restaurants, only a few hit the high-end note just right. We have a tremendous amount of talent in Dallas kitchens, and I believe Bullion will be the restaurant to put our city, finally, at the top of the international culinary map.